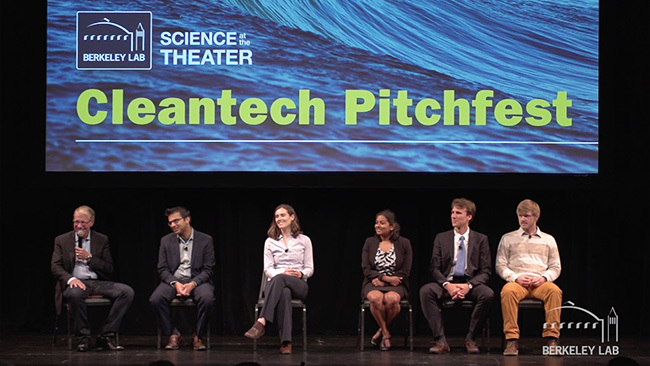 Hear from six Berkeley Lab scientists with big new ideas designed to help transform our carbon-drenched, overheating world. Each has tremendous promise and social value. Current desalination techniques require huge amounts of energy and generate large amounts of environmental waste. Berkeley Lab’s Chinmayee Subban, a Cornell PhD, leads a desalination research project that reduces environmental waste and energy use by incorporating an innovative mix of low-cost materials. The technique could help relieve the stress on global water supplies by reclaiming brackish water both in the US and other countries—including in the developing world. Replacing millions of porous windows with energy-efficient versions in older buildings and homes can be prohibitively expensive. Berkeley Lab’s Raymond Weitekamp, a Caltech PhD, has a new approach: an inexpensive, paint-on, energy-efficient coating that can be applied simply and evenly without the help of a professional—while the windows are still in place. The paintable, clear material contains photonic crystals, developed by his startup company PolySpectra. At CalWave, Marcus Lehmann is developing the WaveCarpet which harnesses the power of ocean waves to produce electricity and freshwater. Avoiding the pitfalls of other wave-energy projects, the WaveCarpet operates submerged, allowing it to survive stormy seas while causing no visual pollution or posing any collision danger. Recently CalWave was selected as one of nine ¬finalists to compete for the Department of Energy’s Wave Energy Prize—a 20-month design-build-test competition. Earlier this year, the German-born Marcus was named to Forbes 30 Under 30 in the Energy Sector. Removing excess carbon from an overheating atmosphere is an urgent and complicated problem. The answer, according to Berkeley Lab’s Jeff Urban, could lie at the nanoscale, where specially designed cage-like structures called metal organic frameworks, or MOFs, can trap large amounts of carbon in microscopically tiny structures. A Harvard PhD with expertise in thermoelectrics, gas separation and hydrogen storage, Urban directs teams at the Molecular Foundry’s Inorganic Materials Facility. Kendra Kuhl co-founded Opus 12 to find out if an electrochemical process, operating inside a desk-sized reactor, can do on an industrial scale what is often hailed as the Holy Grail of carbon-recycling research—convert CO2 captured from smokestacks into ethanol and other valuable products. A self-proclaimed chemistry geek in high school, the Berkeley Lab scientist honed her big idea while completing her PhD at Stanford. A Berkeley Lab scientist specializing in all things vehicular—from powertrain technologies, vehicle electrification and vehicle-grid integration to advanced engine technologies, personalized fuel economy and EV range prediction—Samveg (Sam) Saxena is leading the development of a new app called MyGreenCar. MyGreen Car predicts personalized fuel economy and eliminates EV range anxiety as a barrier for prospective car buyers. He also leads the development of V2G-Sim, a research platform for understanding how vehicles will interface with the grid. If you prefer to watch them all together, the entire program is here. See more programs from the series here.